Not Delia reviews the Tapas Cafe in Sukhumvit Soi 11, Bangkok – a great place for nibbles, wine and sangria! It's January, it's cold, the sky is grey and it's raining. It's time for some hearty food! But this is the month where people are recovering from the excesses of Christmas and New Year. Some of my friends have decided to go veggie for January and have asked me for ideas. The first that springs to mind is soup and we have lots of veggie soups here on NotDelia already. But what about mains? Well, let's have a veggie week! I'll get started today. 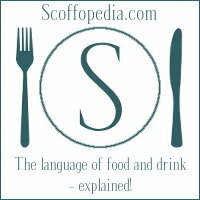 We've also started a new website, Scoffopedia - the language of food and drink, explained. It's a quirky glossary of food. I hope you'll have a look and enjoy it. If you're looking for something which we don't appear to have, you can let me know by commenting on the articles which we do have or by using our contact form. If you have any other comments, questions or suggestions, I'd love to hear from you, so do write in! And, by the way, the Not Delia team is also keen to test food related products, so if you'd like us to write about your goodies, feel free to get in touch. Mystified by menuspeak? Don’t be! Foodie products – for sale and free!